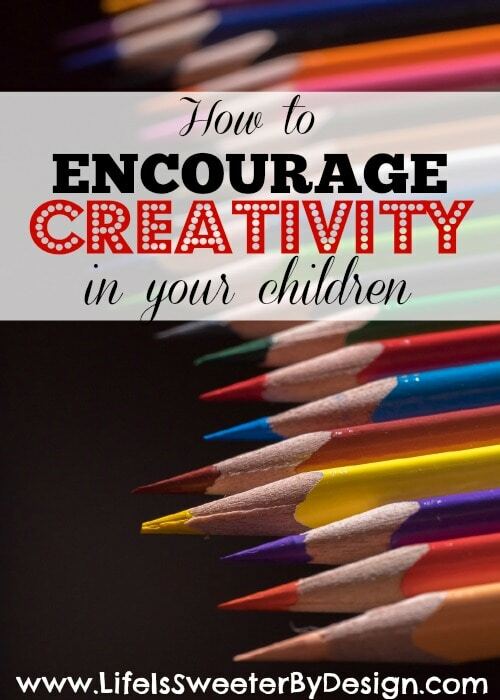 How to encourage creativity in your child may be a question you have asked yourself. Some of us are more creatively challenged than others. If creativity doesn't come naturally to you then you may need some tips to help foster creativity in your children! I try to be creative, but I have to work at it! I am not naturally gifted in the arts, but I try! I was blessed to have a mother who is extremely talented and creative and I have learned a lot from her over the years and she is still my go-to person for crafty questions! I think watching my mother's creative skills when I was a child helped me become more creative myself. It was normal at our house to make our Halloween costumes and decorate things ourselves. Making homemade gifts was something my mom did for other people a lot and those that received her gifts were always really excited! Creativity and art come in so many forms that any child can be creative!! My kids have had creative hobbies from drawing, sewing, duct tape art, loom bands to simple coloring! There are so many fun ways to be creative…even if it is in the kitchen! If you take the time to learn how to encourage creativity in your child you will be blessed by the results! If you are wondering how to encourage creativity in your child, here are some tips! You can begin to expose your children to the arts and the concept of creativity when they are barely even toddlers if not before! As soon as you can get your child coloring, do it! Let them make creations in the driveway with large sidewalk chalk. They can finger paint with a paint brush and water on the cement! There are lots of creative things that young toddlers can do and starting early will get their little brains thinking creatively from the start! Children need to have some room to express their creativity. Let them have the space to allow their own personality to flow. Step back and let them come up with ideas for their own artwork so that their creativity and personality can be exposed! Our culture likes to see a pretty product at the end of our craft or art session. When we are trying to raise creative children we need to remember that it isn't always the end result that matters. The process of creating is just as important as what is created! The project may not turn out the first time, but by trying their hand at it they are letting their brain become more adept at being creative! This is a hard one for me….I try to help “too” much and don't always let my kids do it themselves! They can learn a lot from the process of arts and crafts. If I do it all for them then I am robbing them of those learning opportunities! There are times when a tool may not be appropriate for children of a certain age to use, but even when you have to take over you can still be teaching safe practices! Sometimes being creative is just plain messy! Some parents don't have the energy to deal with encouraging creativity because it can bring more work!! I totally get that and have been there myself! One way to deal with this barricade is to set some limits and rules that you can work with to allow your child the chance to stretch their creative wings, but not cause a huge mess! You may want to have a special location in your house that is for arts and crafts! You may have certain times of the week that you do creative activities. You may have a set rule that the area must be picked up when the child is done working. If your child knows the rules than their will be less stress for the parent and more creativity will be going on! Kids need time in order to be creative. Try to schedule art times according to when there actually is TIME available! Don't rush your child in their creative process. I think most artists would tell you that creativity can't be rushed! Exposing your children to art is an important part of helping them become creative people! Take them to museums, craft shows, and special exhibits. Let me read books about arts and crafts or magazines. Take time in the summer and let them take a class on some kind of art that interests them or that they would like to try! There are even some great online classes available for people who don't live near any kind of art classes. I love the professionalism of the classes that Craftsy offers! They have a ton of different classes that your child could take in the privacy of your own home! What is your favorite answer to the question of how to encourage creativity in your child? What are your child's favorite creative hobbies?